"Never cause discord among your brothers and always practise the rule of obedience; above all when it seems to you that the errors of those in authority are all the more serious. There is no other road than that of obedience, especially for those of us who have made this vow." "No! You will forget it! You will tear apart the community of faithful, oppose the will of your superiors and even go against the orders of the pope himself and this will happen quite soon..."
Source: Pascal Cataneo's book "Padre Pio Gleanings" on page 58. 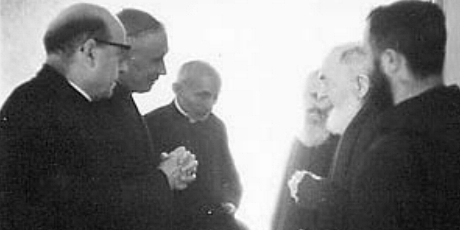 In April 1967, three years before founding the SSPX, Archbishop Lefebvre briefly met the Italian saint and mystic Padre Pio of Pietrelcina to ask his blessing on a forthcoming general chapter of the Holy Ghost Fathers. "Padre Pio looked at Lefebvre very sternly and said: "Never cause discord among your brothers and always practise the rule of obedience; above all when it seems to you that the errors of those in authority are all the more serious. There is no other road than that of obedience, especially for those of us who have made this vow."... It seems Archbishop Lefebvre did not see things in quite the same way even if he did respond to Padre Pio with: "I will remember that, Father." 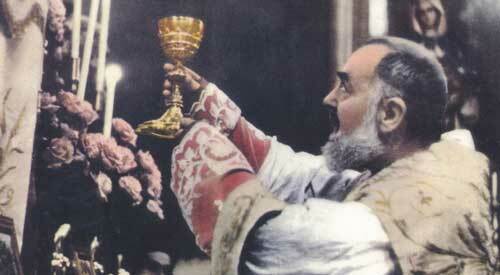 Padre Pio looked at him intensely and, seeing what would soon happen, said: "No! You will forget it! You will tear apart the community of faithful, oppose the will of your superiors and even go against the orders of the pope himself and this will happen quite soon..."
"For several years now this slander, a fabrication from start to finish, has been circulating in Italy. I have already refuted it, but lies die hard; there is not one word of truth in the page of that magazine you photocopied for me. The meeting which took place after Easter in 1967 lasted two minutes. I was accompanied by Fr. Barbara and a Holy Ghost Brother, Brother Felin. I met Padre Pio in a corridor, on his way to the confessional, being helped by two Capuchins. I told him in a few words the purpose of my visit: for him to bless the Congregation of the Holy Ghost which was due to hold an extraordinary General my Chapter meeting, like all religious societies, under the heading of aggiornamento (up-dating), meeting which I was afraid would lead to trouble...Then Padre Pio cried out. 'Me, bless an archbishop, no, no, it is you who should be blessing me!' And he bowed, to receive the blessing. I blessed him, he kissed my ring and continued on his way to the confessional...That was the whole of the meeting, no more, no less. To invent such an account as you sent me the copy of calls for a satanic imagination and mendacity. The author is a son of the Father of Lies. Thank you for giving me the chance to tell once more the plain truth.